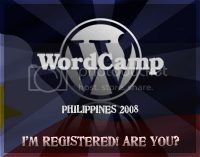 WordCamp Philippines on September 6. Register now! The very first WordCamp in Southeast Asia is happening right here in the Philippines. Organized by the Mindanao Bloggers, WordCamp Philippines 2008 will take place on September 6, at the Augusto-Rosario Gonzalez Theater, 5/F Mutien Building, College of St. Benilde, Taft Ave., Manila. The event will have 2 simultaneous tracks: deployment and development. I wish they didn’t happen at the same time though. Tentative topics are listed here. Registration is free of charge, but the catch is you have to blog about it. That’s a pretty good deal, if you ask me. And you don’t even have to be a WordPress user to be eligible. Sign up here now!